De Lackner DH-4 "Heli-Vector" / HZ-1 "Aerocycle"
The De Lackner DH-4 "Aerocycle" flying platform was the first of several one-man flying machines the Army evaluated during the late 1950s and early 1960s, and was certainly one of the more innovative of these various 'individual lift devices'. Developed by De Lackner as a private venture and originally named the "Heli-Vector", the DH-4 first flew in January 1955. The Army ordered twelve examples 'off-the-shelf' shortly thereafter. The aircraft was initially designated YHO-2 (a designation which was later also applied to five Hughes H-55 helicopter prototypes), though this was subsequently changed to HZ-1. 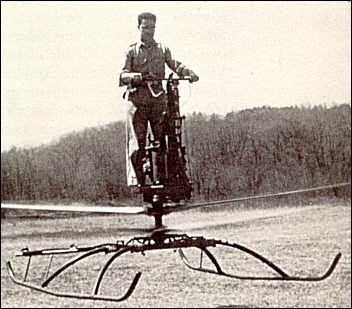 Like the somewhat similar Hiller VZ-1 "Pawnee", the Aerocycle carried its single pilot and 32kW engine on a circular platform located just above two belt-driven, contra-rotating fifteen-foot propellers. The engine throttle and a few basic instruments were attached to bicycle-type handlebars fixed to a three-foot tall pedestal atop the main platform. The pilot stood to the rear of the pedestal and was secured to it by safety belts, and guided his craft by simply leaning in the desired direction of travel. The machine's landing gear initially consisted of a single large air bag placed directly beneath the propellers and augmented by four smaller air bags fixed to outrigger bars, though this system was ultimately abandoned in favor of helicopter-type metal skids. The HZ-1 was surprisingly stable despite its rather ungainly appearance, and its top speed of more than 110kph made it considerably faster than most of the other unconventional one-man flying machines evaluated by the Army. The Army's research into 'individual lifting devices' was intended to explore the feasibility of increasing the mobility of selected ground combat units by providing their members with inexpensive, safe, and easily operated personal aircraft. The Aerocycle was especially successful in the ease of operation category, for during the service tests soldiers required only about twenty minutes of instruction before flying the aircraft. 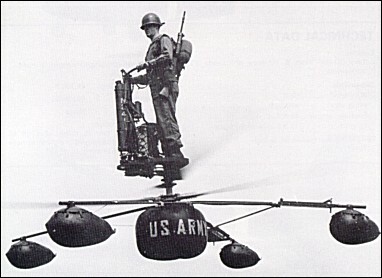 However, the 'individual lifting device' concept was eventually deemed to be impractical in the light of then-current Army tactical doctrine and was abandoned, and the De Lackner Aerocycle thus became no more than an interesting footnote in the history of Army aviation. I had the privilege of knowing and talking to Don De lackner. My father in-law bought the machine shop that Don owned (profile metrics in Hesperia, Ca) in 1988 and we are still operating today as Dyell Machine. He was a very nice and humble man. I remember him showing me this one maned helicopter that he had made. He was 85 years old when we bought the shop from him and was working on a flying car. About 10 years ago a man showed up and asked if he could look in the shop. He told me that he was Dons grandson and he used to work with him in this shop when he was a kid. He stood in the middle of the shop, called his brother, and cried as he told him where he was. I have to admit, i almost cried myself. It was sad to learn that after he and his wife died (from what was told to me from a family friend who called to say Mrs De lackner had passed) there was no money left behind to family, allegedly because of who ever was handling there money (and from what i know it was millions). Iwan Benzler, steh endlich zu Deinem Kind. Du hast mich an der B�rse Stuttgart geschw�ngert bevor man Dich gefeuert hat. Jetzt hast Du Dich bei Weber zum H�userverkaufen beworben. Das klappt nie. Ich beantrage einen Vaterschaftstest. Zahlen musst Du sowieso und wenn Deine Sippe auch das letzte Haus zwangsversteigern muss! This is waldschmitt, me from Johannesberg. BTV - "BE the victorious" is The name of the Game. Who said Tennis? I say Rentner, You say not. I say working, You say "You do not". I only wish I could see a video of the Texas test flight. This was were my father was hurt and it lead to his death. building is easy, but I found a problem in doing so because outboards need warm water if not , does anyone know how to solve the problem? I thought I'd stick a hose between prencipal shaft connecting the engine and no cushion under the rotors , worked ? The original prototype, the DH-4 Aerocycle, registered N64N was recently discovered in storage in the building used by DeLackner in Mt. Vernon, New York. This prototype was acquirred by the Evergreen Aviation & Space Museum in McMinnville, Oregon. It is currently in restoration, and we would welcome any information that would help us with the restoration project! Helmet? Those blades would turn you into hamburger long before your head reached the ground. I had the pleasure if working with Don DeLackner in the 1980's on Apple Valley California , I will remember him as a great man and friend! I have studied this aircraft extensively. The original designs were actually easier to fly than the later models due in part to the Us army meddling with the design. The orginal had a 20hp water cooled outboard boat engine with open exhaust. Transition to lift occurs around 650 rotor rpm's. It used a planetary gear box below the platform to reverse the rotation of one set of blades. Blades were experimented with largely as was the gearing and pod legs. Original blades were 7.5 feet with the leading tips made of nylon for canceling out the harmonic that would develop. During the testing of this craft there were several serious accidents but none fatal. The final set of blades were 15 feet long with almost 7 foot of nylon making up half the length of the blade. All blades were fixed pitch. When the Us army showed interest in the late 50's the engine was changed to an evinrude V4 making 55 horse power and then increased with the same engine to make 79 horse power. The accidents occured because of tip flexing in response to more horse power which created a substantial harmonic and caused the blades to collide in flight. The pilots were injured severely, but altitude played a part in not causing a fatality due to the accident occuring at about 70-100 feet. The 20 hp version was suprisingly easy to fly even with out trying. Once the engine was runing-the rotors will not turn due to a belt clutch, the operator stands up on the platform and using a belt and leather shoe restrainers, buckles in. Next the clutch handle is released, which allows the rotors to begin to turn. When rotor rpm is stable at around 210 rpm's, the throttle is advanced smoothly to attain 650 rotor rpm. The device will lift off!! As long as you don't lean right, left, back, or forward, the device will hover around 7-12 ft off the ground at around 700 rotor rpm. Leaning in any givin direction, will cause the device to fly in that direction. Flights out of ground effect are harder and not recommended on the 20 hp model. Ground effect limits for the 20hp model are around 20-40 feet. Please send any plans to me at this email address. There must be a company in Spain wich presented a very similar equipment in Paris Air Show 2007. AMAZING��. We are working in a prototype, but the rotor aerodinamycs and blade construction (suppouse in carbon)are extremely difficult, and the automatic clutch are very complicated. does anyone has some very precize plans of how to build this 'helicopter'? I need to know every detail.